Edit: I guess this is the last time I try to post on Blogger from a mobile device - this post was finished and up, and then when I came back to work on another one I realized that most of it had been eaten and it was set back to draft. Why? Who knows. Probably user error. Apologies! This post is later in the month than I've usually been for the HSM. I just didn't know what to go with! 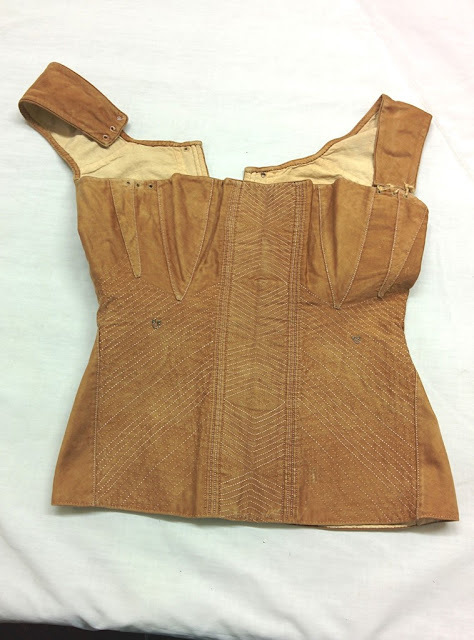 But in the end, I've decided in the end is to give you a preview of Regency Women's Dress 1800-1830 (out sometime in October): the corset made out of brown cotton twill and its description. Longer corsets of this type were taken up not long after the turn of the century, and were worn for several decades, not falling out of use until the 1850s, when the popularization of the split busk made it even easier for a woman to put on or remove her corset herself. The shape gave a smooth line to the body and bust support, but without the vertical channels for whalebone that had been a necessity in creating the eighteenth century silhouette. Very little seaming was required: as with this example, the entire body of the corset could be cut in one piece, with triangular gussets added at the bust and hips to create the garment's shaping, and straps added at the shoulders – a requirement for this type of corset, as the lack of boning (apart from the wooden busk running down the center front) meant that the bust needed the support of straps, like a modern bra. The gussets are all topstitched over the body of the corset on the outside, while the body is topstitched over the straps; the gussets in the lining are whipped over the body lining, and the straps under. While earlier stays tended to be made either entirely from or on a foundation of linen canvas, corsets in this style were usually a cotton twill. This corset is made from brown cotton twill, and lined with a plain-woven white cotton. Most early nineteenth century corsets make significant use of cording and/or quilting. This one is topstitched in white and brown silk thread in the zig-zagged pattern down the busk pocket (the lining is itself quilted with running stitches down the length of the pocket), in the angled lines across the midsection, spaced ¼" apart, and in the curved lines next to the row of eyelets in the back. As time went on and a narrower waist became more desirable, it became common for the corset to be more heavily reinforced with cording across the hips and around the waist. 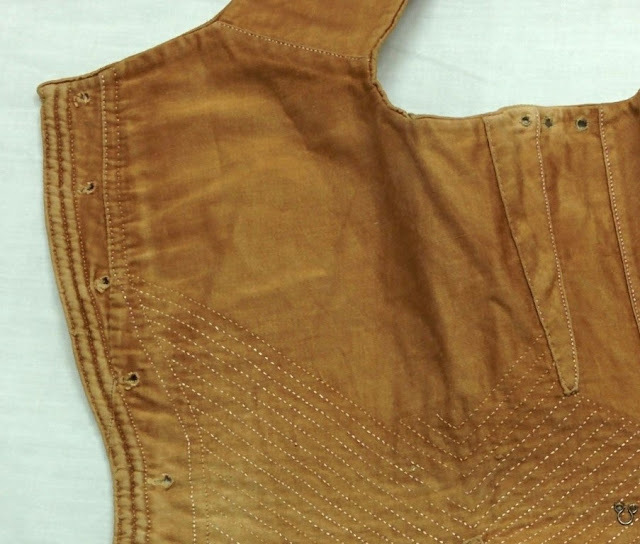 The upper edge of the corset is turned down and piped, with the back edge of the busk pocket turned in separately to facilitate adding or removing the busk. The lower edges are turned between the layers and whipped together. The curved center back edge is corded in two rows next to the eyelets, all of which are sewn in brown silk thread. At the Xs are sewn downward-pointing metal eyes. These were likely used to hold a petticoat fitted with matching hooks: the only other way to hold a petticoat up to the high waistline would be to attach straps to it. Fantastic! Super documentation of construction. Solves many questions I've had about this type of corset. I love the info about the eyes on the stays, a really practical solution.